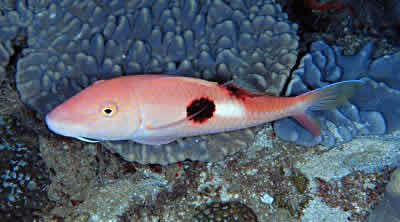 Dennis Polack sent in a photograph of the blackspot goatfish, Parupeneus pleurostigma, SSF 196.9. Dennis photographed it at Sodwana earlier this year, it was previously known south to Maputo. Jack Randall, an ichthyologist based in Honolulu, who is revising the goatfish family, will be using Dennis’ Sodwana photograph as the basis for this new distribution record for South Africa. Video footage taken from the underwater submersible, Jago, at Sodwana, gave us the first record of the rockcod, Epinephelus retouti, the red-tipped rockcod, for Africa. It is known from the islands of the Indo-Pacific. NEW DISTRIBUTION RECORD FOR AFRICA - PHOTOGRAPHED AT PONTA MAMOLI, MOZAMBIQUE, BY FISHWATCH MEMBER, DENNIS POLACK. This snapper looks like Lutjanus vitta which was previously reported from in our area – the western Indian Ocean [WIO] – from India [by Day in the 1870s and illustrated in black and white] & the Seychelles [by JLB & Margaret Smith]. We do not have any WIO photographs nor can we find any in the literature, so as well as being a new record, this photo will be particularly useful. The fish does not have exactly the same pattern as Lutjanus vitta from the Pacific or eastern Indian Ocean. The oblique lines above the LL are wavy not straight & there appear to be fewer of them than the Pacific specimens we have seen. Nor does it have the yellow tail [caudal] fin of the Pacific specimens. It also has a yellow belly not apparent on Pacific fish. We are assuming, until we get a specimen, that it is a WIO colour pattern variation rather than a new sister species of Lutjanus vitta. Sally Polack photographed a sailfin goby at Ponta Mamoli, Mozambique. 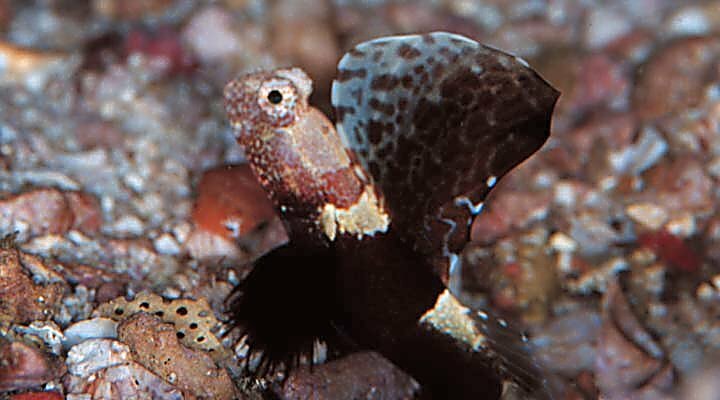 World goby experts, Helen Larson from Australia and Rick Winterbottom from Canada are not sure what it is but think it might be a species new to science, possibly a Vanderhorstia or Tomiyamichthys. The handout for the shark underwater worksheet was completed.